Inspired by the amazing depth and character of Heathcote Shiraz, the Bialkower and Kirby families selected a rare and ideal location to produce an ultra-premium Shiraz to rival Australia's finest. 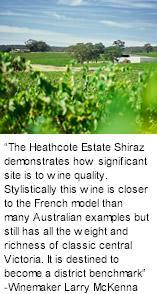 Heathcote Estate was established in 1999 as an ultra premium producer solely focused on the production of one wine, a single vineyard Shiraz. The Bialkower and Kirby families shared vision of excellence is reflected by their single-minded focus towards quality across all parts of the winemaking process. Having grown up in the fine wine and food environment that was Melbourne in the 1960s and 70s, Robert Kirby has long been fascinated by fine wine, especially the soft and medium-bodied French varieties Pinot Noir and Shiraz. His childhood was also spent on the Mornington Peninsula , where his family owned cinemas and it was only natural that his first vineyard should have been in that region at Red Hill. By 1992 he planted 6 hectares at Cooralook and since then has planted a much larger vineyard at Tuerong Road Mooruduc. Louis Bialkower carried on a busy legal practice in Melbourne for many years, coming to wine on a professional basis in 1982 when he founded Yarra Ridge in the Yarra Valley and though that estate was sold to Beringer Blass in the 1990s, he has been continuously involved with wine since that time. "Ten of the best new wineries"